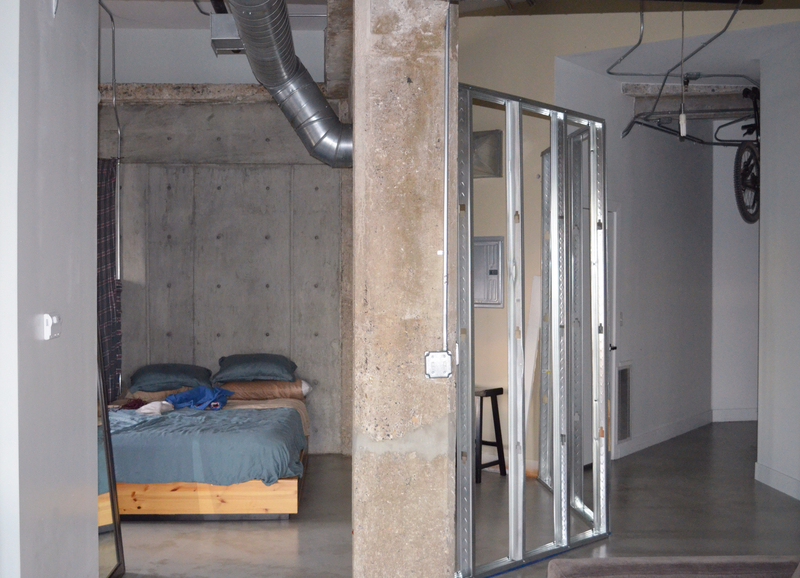 We really can't catch a break with this permanent wall installation. Last week our contractor and his drywall guy showed up to start building our 8-foot partial wall that will close off our bedrooms from the entryway of our loft. 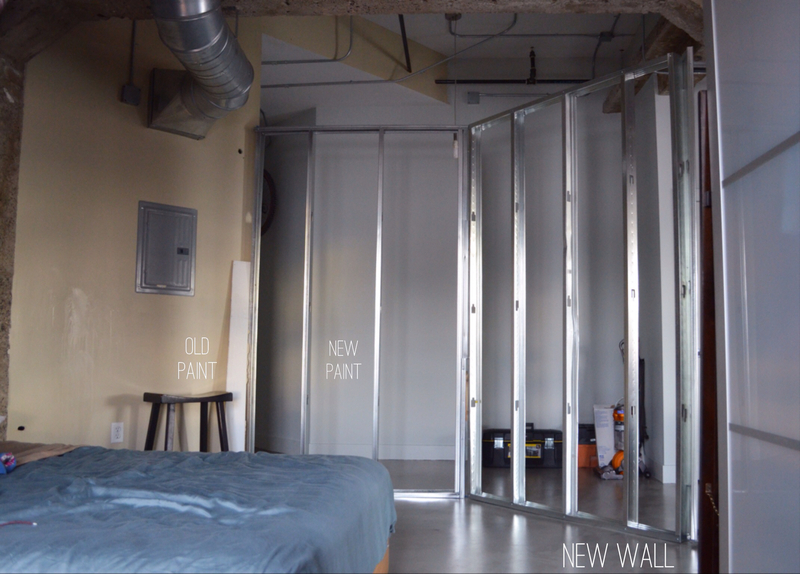 After discussing the plan and going over Lee's pre-taped lines for where the wall should go, our contractor left and the drywall guy got started putting up the metal studs. Alice and I headed to my mom's so as not to hinder his progress and waited to get the all-clear from Lee that the drywall guy was finished for the day so that we could head home. When Alice and I got home later that afternoon, we found Lee standing with arms crossed inspecting the newly placed metal studs. And it turns out those studs aren't level and aren't even in-line with what was planned. Oh. And the drywall guy cracked our newly refinished concrete floor. 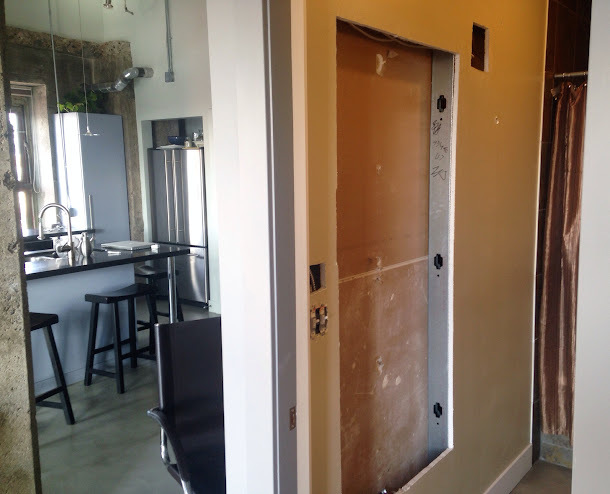 To give this drywall guy a little credit, this isn't a straight-forward wall-building job. 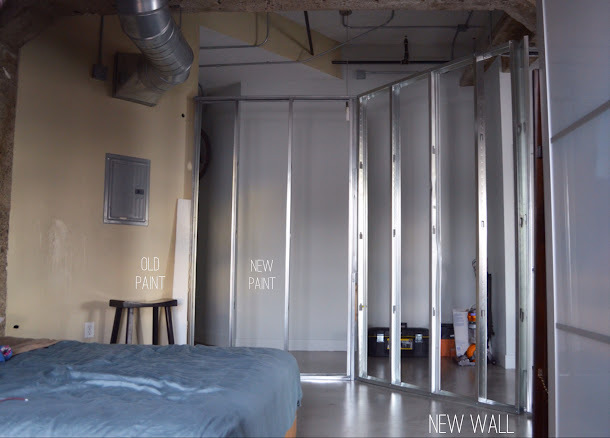 Since our wall won't touch the ceiling and has a few angles in it, it could have a bit of a lateral stability problem so it is imperative that the studs be placed correctly from the start and that some reinforcement be done at the top so the wall isn't wobbly. Our contractor came by to inspect the work and also agreed that the studs needed to be better placed before we proceed with the actual drywall placement so, once again, we are in loft remodel limbo. The good news, though, is that Lee knocked a hole in our bathroom wall today to reroute the electrical and to make space for our recessed cabinet which is supposed to be finished and ready to install at the end of the week. Neither of which the drywall guy or the contractor have anything to do with. Oh Crapola! Cracked your new floor? So sorry that these guys can't take the time to be professional and get it done right the first time. Crooked wall? Crapola again! BUT, it will be great once it's finished... just a few headaches along the way. Love you!